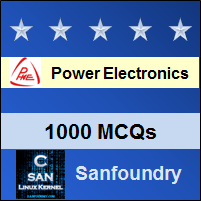 This set of Power Electronics Multiple Choice Questions & Answers (MCQs) focuses on “Applications of Power Electronics-1”. Explanation: SMPS (Switching mode power supply) is used for obtaining controlled dc power supply. 2. SPMS are based on the ________ principle. Explanation: SMPS (Switching mode power supply) are based on the chopper principle. The output dc voltage is controlled by varying the duty cycle of the chopper circuit. 3. Choose the incorrect statement. Explanation: SMPS has higher output ripple and its regulation is worse. 4. _________ is used for critical loads where temporary power failure can cause a great deal of inconvenience. Explanation: Uninterruptible Power Supply is used where loads where temporary power failure can cause a great deal of inconvenience. 5. __________ is used in the rotating type UPS system to supply the mains. Explanation: When the supply is gone, the diesel engine is started, which runs the alternator and the alternator supplies power to the mains. Non-rotating type UPS are not used anymore. Explanation: Rectifier to converter the dc from the battery to ac. Inverter to charge the battery from mains. Explanation: No dip or discontinuity is observed in case of no break static UPS configuration, as the battery inverter set immediately takes over the mains. 8. Usually __________ batteries are used in the UPS systems. Explanation: Lead acid batteries are cheaper and have certain advantages over the other types. NC batteries would however be the best, but are three to four times more expensive than Lead Acid. 9. HVDC transmission has ___________ as compared to HVAC transmission. Explanation: The conductor size is smaller as there is no sink effect, and the whole conductor is utilized for transmitting power. Explanation: The monopolar link uses just a single conductor, which is usually negative as it produces less radio interference and corona.